Redding - NRVT was granted $300,000 for Norwalk River Valley Trail - Redding Mile as part of the CT DEEP Trail Grants. 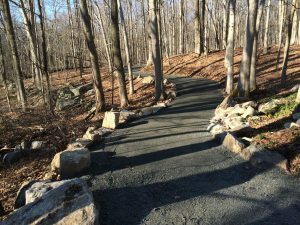 The Connecticut Department of Energy and Environmental Protection (DEEP) announced that it has awarded $3,173,530 in grants for nineteen projects to plan and design, build, expand, or enhance and improve multi-use trails and greenways across the state. Redding - NRVT applied for money to pay for “the first section of the trail to be constructed in Redding - NE Greenway connection and Route 7 Bikeway”. $3 million was allocated at the end of July by the state bond commission. Turned back funds from previous grant years provided the additional $173,530.50 to allow funding awards for most of the highly ranked proposals. The Connecticut Greenways Council serves as an advisory committee to DEEP for grant selection. DEEP received 73 applicants. This round was very competitive with 3 million dollars to distribute, there were over 12 million in requests. Requests from the highly ranked proposals alone totaled over 4 million dollars. Funds received through this program may be used for locally supported trails and trail systems, bikeways and multiuse paths. Grant money can be allocated for a wide variety of purposes, including planning, design, land acquisition, construction, construction administration, and publications for bikeways, walkways, and greenways as well as for equipment and trail amenities, such as parking lots, toilet buildings, signs, and benches. DEEP envisions most projects being completed by spring 2021. Click here for a full list of awards.